William George "Billy" Barker (1894-1930), the most decorated serviceman in the history of Canada and the British Empire, was one of Canada's most renowned First World War heroes. He grew up riding horses and hunting on a farm near Dauphin, Manitoba. After watching airplanes at a local exhibition, he became fascinated with the idea of becoming a pilot. He enlisted with the 1st Canadian Mounted Rifles on December 1, 1914, and served as a machine-gunner in France until early 1916, when he transferred to the Royal Flying Corps (RFC) and qualified as a pilot in early 1917. 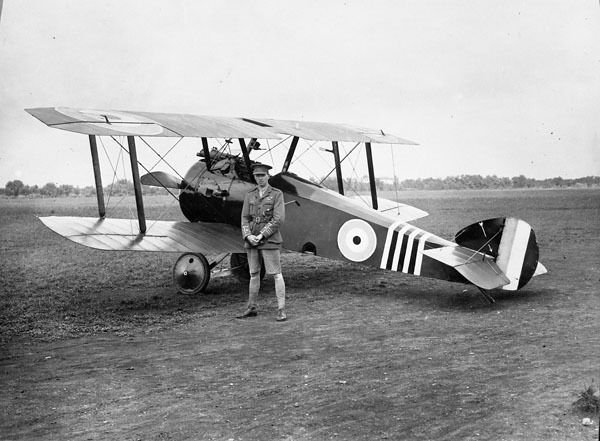 During his career with the RFC, Barker was credited with fifty-three aerial victories. He was awarded the Military Cross in the concluding stages of the Battle of the Somme for spotting German troops massing for a counter-attack and for calling down an artillery attack that broke up the 4000-strong force. On October 27, 1918, Barker was attached to 201 Squadron and flying a solo excursion over the Forêt de Mormal when he encountered a formation of Fokker D.VIIs from Jagdgruppe 12. In the battle that ensued, despite being wounded three times in the legs and having most of one elbow shot away, Barker repelled the Germans and shot down four of their aircraft before crash-landing inside Allied lines. Severely wounded, he was awarded the Victoria Cross for his actions. After the war, Barker and William Avery "Billy" Bishop, another Canadian flying hero, founded an airline in Toronto. In 1924 Barker was appointed a senior officer in the fledgling Canadian Air Force. He subsequently became the first president of the Toronto Maple Leafs. Barker was killed on March 12, 1930, when the plane he was piloting during a flight exhibition crashed near Ottawa. Description: Fair complexion, grey eyes, light brown hair. Wesleyan. Next of Kin: Father, G.W.J. Barker, living in Dauphin, Manitoba. "Capt. (A./Major) William George Barker, D.S.O., M.C., No. 201 Sqn., R.A. Force. "On the morning of the 27th October, 1918, this officer observed an enemy two-seater over the Fôret de Mormal. He attacked this machine, and after a short burst it broke up in the air. At the same time a Fokker biplane attacked him, and he was wounded in the right thigh, but managed, despite this, to shoot down the enemy aeroplane in flames. "He then found, himself in the middle of a large formation of Fokkers, who attacked him from all directions; and was again severely wounded in the left thigh; but succeeded in driving down two of the enemy in a spin. During this fight his left elbow was shattered and he again fainted, and on regaining consciousness he found himself still being attacked, but, notwithstanding that he was now severely wounded in both legs and his left arm shattered, he dived on the nearest machine and shot it down in flames. "This combat, in which Major Barker destroyed four enemy machines (three of them in flames), brought his total successes up to fifty enemy machines destroyed, and is a notable example of the exceptional bravery and disregard of danger which this very gallant officer has always displayed throughout his distinguished career. Major Barker was awarded the Military Cross on 10th January, 1917; first Bar on 18th July, 1917; the Distinguished Service Order on 18th February, 1918; second Bar to Military Cross on 16th September, 1918; and Bar-to Distinguished Service Order on 2nd November, 1918."